To the delight of my husband an apple pie just came out of oven (oh he how loves this blog). The cinnamon is making the house smell so good! I've been making apple pies for him for a long time and pie crust used to be so hard for me. I found over the years if I can get the dough just moist enough I can roll it out much better. So I added more water than the standard recipe called for and more shortening. The result is a nice flaky crust. 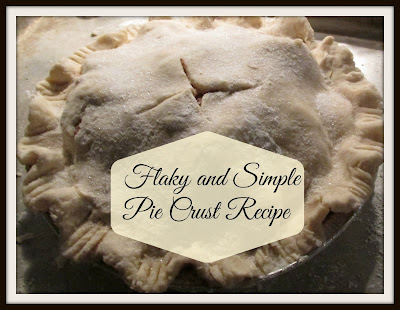 Home made Pie crust taste so much better and costs so much less than store bought. You can also make a few up ahead of time and freeze them for later! Mix the flour and sugar together. Using a fork mix in shortening until looks like small peas in your bowl. Add in water a couple of Tbsp. at a time until you can make the dough into a ball. Make two balls. Roll out two pie crusts and fill with your pie filling. Tip: In order to transfer to a pie pan roll up the dough on your rolling pin. Tip: You can get a little fancy if you want or you can just use a fork to seam the two pie crusts together. My Mother used to call them Chicken scratches. You can find my recipe for Apple Pie here. You can see all the blog parties and hops I link to here!